If anything, Gold Standard has delivered a very tightly themed set for collectors over the past few years. Every aspect of the set relates to the precious metal Gold – which actually had quite the price decline in the months leading up to this set being released. This year includes ‘real metal’ cards inserted one per box, which might give the set even more of a gold feel. 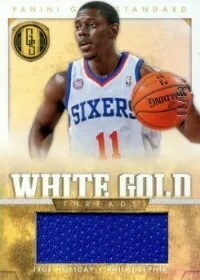 However, the ‘real gold’ cards in past years have fallen about once per case. This set has been known to have a fairly deep checklist with lots of veterans & stars – along with rookie cards. This year is pretty deep as well.